An interesting twist on twice-baked potatoes ~ coriander and cilantro bring out the earthy sweetness of the parsnips, a sadly under appreciated vegetable. The whole combines wonderfully with nutty Gruyère. This dish makes a lovely addition to any Thanksgiving table, and can be served year round. Prepare the crème fraiche several days in advance: Whisk the yogurt into the cream, cover with plastic and let sit in a warm spot at room temperature for 24 hours, stir, then refrigerate overnight prior to use. Preheat oven to 350 degrees Fahrenheit. Wash & scrub potatoes, and dry them well. Line a baking sheet with parchment paper. Slice potatoes in half lengthwise, and brush both sides with olive oil, and sprinkle with salt and pepper. Bake, face down on the parchment paper, for 45 minutes. Meanwhile, sauté the bacon in a dry skillet, covered, until cooked through and somewhat crispy. Remove from pan to a paper towel-lined plate. Once bacon cools, chop it coarsely into ‘bacon bits’. Saute the onions in the bacon drippings, sprinkle with salt, covering slightly to sweat. Cook about 5 minutes or so until soft and transluscent; add the minced garlic, cook 2 minutes. Add the ground coriander and freshly grated nutmeg, good pinch of cayenne, and freshly ground pepper. Cook, stirring, 30 seconds. Add the stock to deglaze; bring to a brief boil, scrapping the bottom of the pan. Reduce heat, and allow to simmer until liquid reduces slightly, but still amply covering the onions. Set aside until needed. Melt 4 tablespoons of the butter. Once the potatoes are done, increase oven temperature to 425 degrees Fahrenheit. Peel the carrots. Peel and core the parsnips (core is tough and fibrous), and cut them 1-inch chunks. Toss the carrots & parsnips with the melted butter, and 4 tablespoons of the olive oil. Sprinkle with salt & pepper, and roast for 30 to 40 minutes, or until vegetables are very soft. Shake pan and toss after 20 minutes. Reduce oven temperature to 375 degrees. 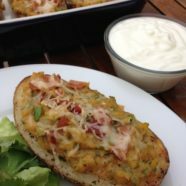 Remove the potato flesh while still warm: Slice around the edge of each potato skin, leaving ¼-inch border of potato on the sides and bottom of skin, and scoop out interiors. Mash the potatoes coarsely with a large fork, incorporating the 4 tablespoons unsalted butter and 4 tablespoons of olive oil; sprinkle generously with salt. Set aside. Place the cooked carrots, parsnips, and onion-stock mixture in the bowl of a food processor, and puree until completely blended. Mixture will thicken as liquid is absorbed into parsnips. Stir mixture into the mashed potatos, add 1 cup of the grated cheese and the chopped cilantro. 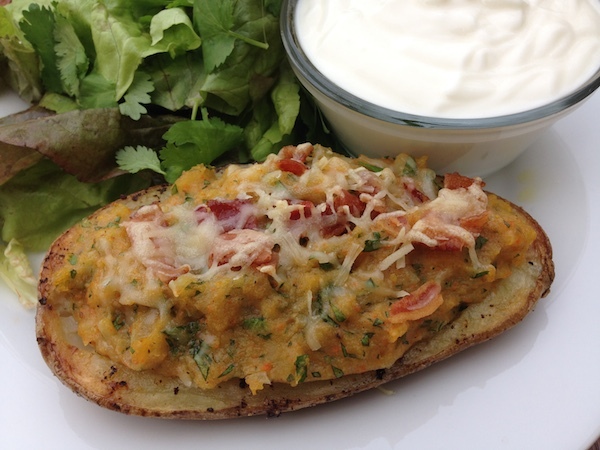 Drizzle olive oil into each potato skin, and sprinkle with salt and freshly ground pepper. Place approximately one-half cup of filling into each skin, and top with the bacon and reserved cheese. Bake 20 minutes in a 375 degree oven. Serve warm with a dollop of crème fraîche, if desired. To reheat as leftovers, place in a baking dish with just enough water to cover the bottom of the pan. Cover dish with foil and bake 30 minutes in a non-preheated oven at 300 degrees.